Co-authored by CFC Media Lab and OmersVentures, in collaboration with Nordicity. Co-authored by CFC Media Lab and OMERS Ventures, in collaboration with Nordicity, this workflow and ecosystem study focused on the Virtual Reality (VR) ecosystem in Canada. The study objectives are to map out the key players in VR content creation and technology development from key regions across Canada. To continue reading our Executive Summary, download the PDF. In 2017, the Canadian Film Centre’s Media Lab, in collaboration with Nordicity and OMERS, released Pulse on VR, a website built to house the results of data collection and analysis on the VR industry in Canada. Help us keep this database current and accurate by adding your voice to the chorus of VR firms that have already responded, or by updating your existing response based on any changes over the last six months. Want to access key VR insights for this quarter? Download the PDF here. Complete our survey and contribute Key Insights to The Pulse on VR. If you have questions about completing our survey, contact us. We surveyed almost 300 companies working on VR projects employing almost 2,500 people. Some companies, especially those founded in the last few years, are wholly dedicated to VR - others have VR departments innovating within a larger workforce. What kinds of companies are VR employees working for? Three out of every ten companies surveyed focus exclusively on virtual reality products. Since 2014 there has been a 22% increase in the number of companies working in the VR landscape. 16 out of every 20 VR companies in our survey are working on developing content for commercial use - in today's VR market, content really is king. Internally, companies are making a much wider range of products in order to create the tools needed to support innovative VR content. What're they building in there? Our survey captured more than 300 projects currently under development across the Canadian VR ecosystem. Around 30% of these projects are already generating revenue for their creators. Just over half of VR companies are focusing on developing a single product. One in three surveyed companies are at work on three or more products. And where are they building them? More than 40% of the VR products under development are being produced in Ontario. VR innovation is happening at a fever pitch in Ontario. Content creators are making VR products that cater to a wide variety of content experiences. Around two-thirds are creating gorgeous landscapes, museum exhibits and other passive experiences, but almost all of them are engaged in creating some kind of active content. What tools do content creators use? Though 3rd party software development kits and application programming interfaces are the most commonly employed tools, almost half of content creators are making use of open source developer tools. Distribution of VR products occurs primarily through proprietary apps, websites, and through online distribution portals and partnered app stores. Creation platforms and 3D engines are the tools most commonly created by VR companies to support innovation in VR content. The creation of software development kits and application programming interfaces is the most important application development software for surveyed VR companies. VR companies involved in provision of backend solutions are primarily involved in providing data storage solutions and cloud services. A minority are also involved in providing data security services. VR companies in our survey are more likely to be creating cameras, position and room trackers, and controllers. Who are VR companies working with? More than seven in ten surveyed VR companies work with partner organizations. Of those who do, more than a third work with other VR start-ups or film and TV production companies. How long till we hit the Big Time? VR companies are excited about the prospects for the industry's future. More than 50% of them anticipate VR will be a mainstream medium in five years or less. 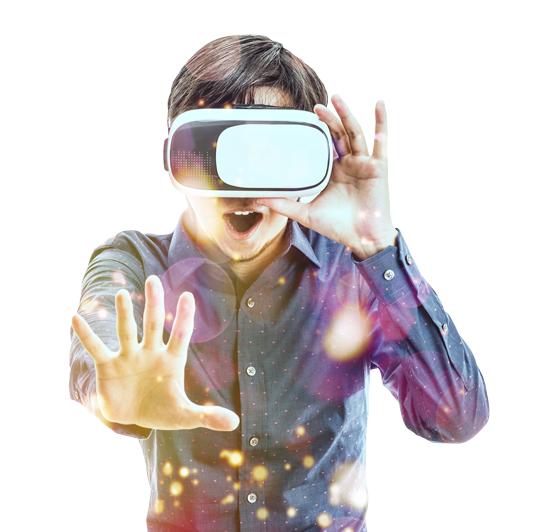 While the general public remains the highest priority target for clientele, more than half of surveyed companies are producing VR aimed at the core of VR enthusiasts, and more than half are creating VR products for business clients and marketing agencies. Where is the market now, and where is it going? The vast majority of VR companies are concentrated on the entertainment sector for the present. Looking to the future, surveyed VR companies anticipate significant diversification of market segments, spanning education, live events, job training, tourism/hospitality and real estate. The largest obstacles to success in VR today are the overall maturity of the VR market and private financing. In a young, rapidly growing industry, these are understandable concerns. Through in depth interviews, learn about some of the top VR companies in Canada.